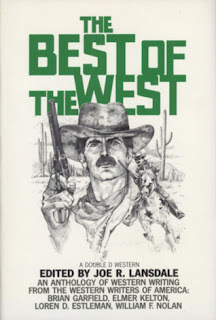 The Best of the West, edited by Joe R. Lansdale, subtitled “An anthology of western writing from the western writers of America.” Doubleday & Company, 1986, 178 pages. This is a collection of stories selected by Joe Lansdale, and including in introduction by Lansdale. Before I talk about the individual stories, I’ll give my overall viewpoint. I’d generally say I enjoyed most of the tales but the title is very misleading. A better title might have been, “Tales of a New West,” or something along those lines. 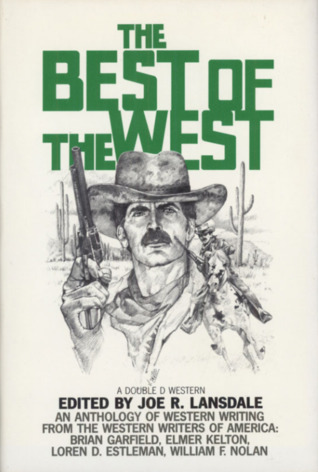 Most of these tales are nowhere near traditional westerns. Lansdale is clear in the introduction that that was what he was looking for but the title certainly would have led me to expect a different sort of collection. At Yuma Crossing by Brian Garfield: Actually set in the traditional western timeframe but a bit unusual in characterization. Overall, fairly traditional. In it, a man called the “Gringo” comes out of the desert to cross a river by ferry, but finds the ferry stranded on the far bank. He also finds an old man and woman, and a young girl who appears to be Indian. The old man is dying. The Gringo is depicted largely as an anti-hero, but he does seem to be susceptible to sympathy for the young girl. Anthologists often put their strongest tales up front and at the end. I don’t know if Lansdale intended that here but Garfield’s story was my favorite in the book. Take a Left at Bertram by Chad Oliver: I’ve enjoyed work by Chad Oliver before. His story here is far from traditional, however, and I didn’t get a lot out of it. It’s well written and short but lacks conflict. Two men go fishing in Texas in the modern day. They are way out in the wilds and a temporal rift occurs that brings some stone age hunters together with the fishermen. Nothing happens, though, and the phenomenon disappears as fast as it came. The Second Kit Carson by Gary Paulsen: a flash fiction piece set in the modern world. The narrator is a drunk and it’s unclear how much of what happens was real and how much he imagined. Nothing traditional in this piece. Well written, but it didn’t do much for me. Night of the Cougar by Ardath Mayhar: This one is pretty traditional as to setting, but the hero is a woman, a mother who has to protect her child from a cougar while on the road in the dark. Lots of conflict here, lots of suspense, and some very fine writing. One of the top stories in the anthology. Jasper Lemon’s Ba Cab Ya Larry by Lee Schultz: A poem. Only two pages. Interesting and enjoyable. Stoned on Yellow by LoLo Westrich: Completely modern setting, with a touch of mystical seasoning. Well written, but more of a horror or magical realism tale than a western. Making Money in Western Banking by Jeff Banks: Pretty traditional. We have a group of outlaws who are robbing banks. One has decided to quit but is persuaded to go on one last job. As you can guess, things don’t work out. A fun story, with a bit of humor. A Bad Cow Market by Elmer Kelton: A modern tale but with western tropes. The bottom has fallen out of the cow market and a rancher is about to give up on his dream. He is reminded, though, of how much the place means to him and finally hits on a possible way to save his ranch. This is a character study mixed with a certain amount of yearning for the simpler life. I thought it was very well written and enjoyed it. Peaches by Lenore Carroll: A cute tale. Fairly traditional in setting. A buffalo hunter comes to town with a hankering for peaches only to find out that the local madam has bought all the canned peaches up for herself and her girls. The hunter has to do some quick thinking to try and get his share of the peaches. I enjoyed it. A fun tale. Judas and Jesus by Thomas Sullivan: Another fairly traditional tale. We have the trope of the world weary gunfighter who happens to have his guns named Judas and Jesus. He rides into another town only to be confronted by a little kid who wants to chance him but doesn’t have a gun. Some very fine descriptive writing here and an emotional ending that I liked a lot. Sallie C. by Neal Barrett, Jr.: I’ve much enjoyed many of Neal Barrett’s books. This particularly story is not a favorite for me, however. It’s mostly a kind of reveal story, with a certain amount of “almost” magical realism in it. There’s not a lot of conflict but some. Well written but I personally didn’t find a lot of payoff in the ending. The Nighthawk Rides by William F. Nolan: This was one of the more interesting tales in the book, but very traditional in the sense that it’s basically a “Zorro” story told with a different character in a different setting. It’s also written as a teleplay rather than in traditional prose. Nolan mentions in the introduction to the story that it came about when he was asked to create a teleplay for a Zorro type TV series. It was never produced, though, and you’ll get a laugh out of why. Anyway, I liked this story quite a bit. One of my favorites in the collection. The Bandit by Loren D. Estleman: An old outlaw gets out of prison and tells his story to a newspaper man while he’s waiting for a train. The setting is largely modern although the story within the story takes place in the past with a robbery gone wrong. Think “The Great Northfield Minnesota Raid.” Well written, as you’d expect. There was a real lack of tension since the events being told about happened long ago in the story. However, the ending twist is the reason why the tale was told in that fashion. Enjoyable but not one of the strongest tales in the collection in my opinion. From your descriptions, that is an unusual collection of Old West stories. thansk for sharing this..pinoyofwtv.network is one of the most popular site which share with you all the latest pinoy replays. We provide you all the replays in hd.